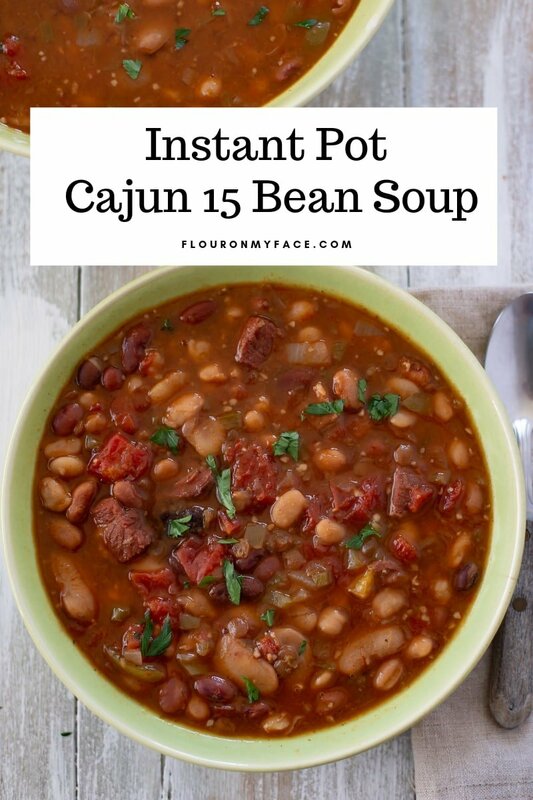 Instant Pot Cajun 15 Bean Soup is packed full of the spicy flavors of your favorite Cajun recipes. 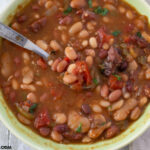 Cajun 15 Bean Soup is a soup recipe you definitely don’t want to miss. This easy no soak 15 bean Instant Pot soup recipe is ridiculously easy to make. 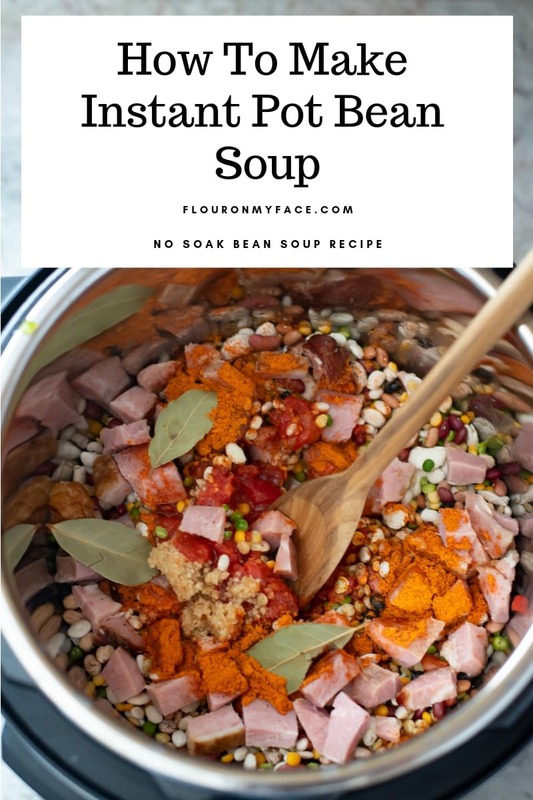 No soak bean soup recipes are becoming one of my favorite Instant Pot recipes to make this winter. 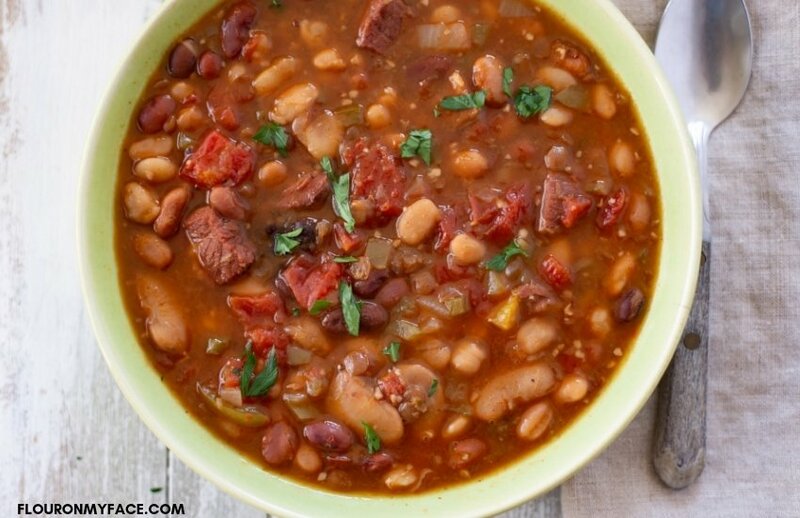 Instant Pot Cajun 15 Bean Soup recipe is thick, rich and packed full of the flavor of 15 different dried beans and diced ham pieces. Making a delicious homemade soup recipe is so easy when you start with a bag of Hurst’s 15 Bean Soup beans. You’ll need a few other ingredients but all the Cajun seasoning come from the Hurst Cajun seasoning pack included with the dried beans. I used some leftover ham I had in the freezer from the holidays. You can also use bacon or a ham hock to make this and any other dried bean soup recipe that calls for ham. 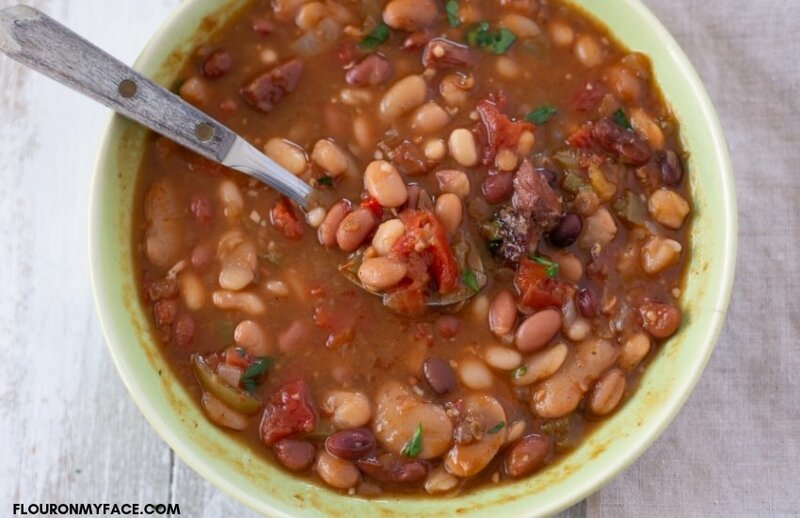 The Instant Pot makes it so easy to use nutritious dried beans to make a soup recipe. You don’t have to soak dried beans before cooking them in the Instant Pot. 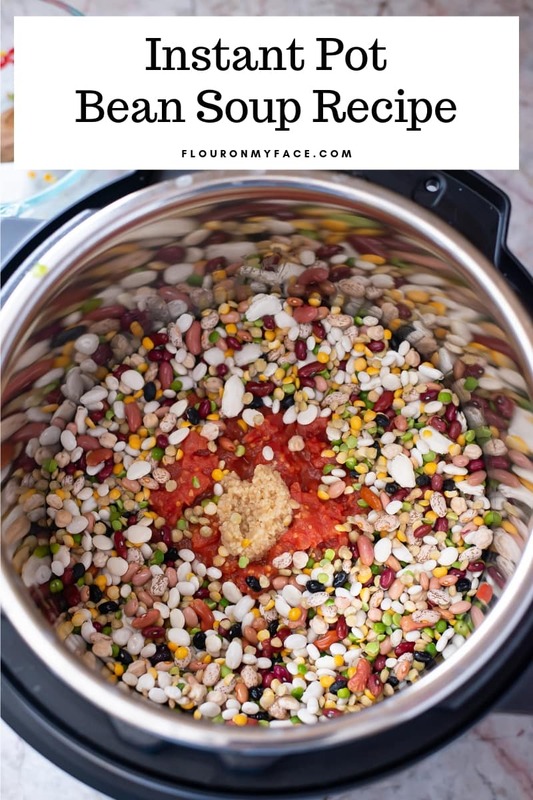 This is one of the best things I love about using my Instant Pot to make soup recipes with dried beans. Dice the sweet onion and sweet bell pepper and add to the Instant Pot. Next, add the un-drained can of diced tomatoes and the minced garlic. Open the bag of Hurst’s Cajun 15 Bean Soup. Remove the season envelope and set aside. Pour the beans into a colander and rinse with cold water. Pick through the beans and discard any debris. Pour the rinsed beans into the inner pot of the Instant Pot. Add the diced ham and bay leaves to the Instant Pot. Open the envelope of Cajun soup seasoning and pour into the Instant Pot. Add the 8 cups of chicken broth to the Instant Pot and using a large spoon stir to combine. Place the lid on the Instant Pot and make sure it is locked into place. Check the pressure valve and make sure it is in the sealing position. Press the manual button and set the time to 35 minutes. Allow the Instant Pot to naturally release steam for 20 minutes. Instant Pot Cajun 15 Bean Soup is packed full of the spicy flavors of your favorite Cajun recipes. Cajun 15 Bean soup is a recipe you definitely don’t want to miss. This easy no-soak 15 bean Instant Pot soup recipe is ridiculously easy to make and is done in under an hour from start to finish. Packed full of spicy flavors, diced ham, 15 dried beans, diced tomatoes, onion, garlic, and sweet bell peppers. Push the manual button and set the time to 35 minutes. Carefully open the Instant Pot and serve with crackers or crusty French bread. 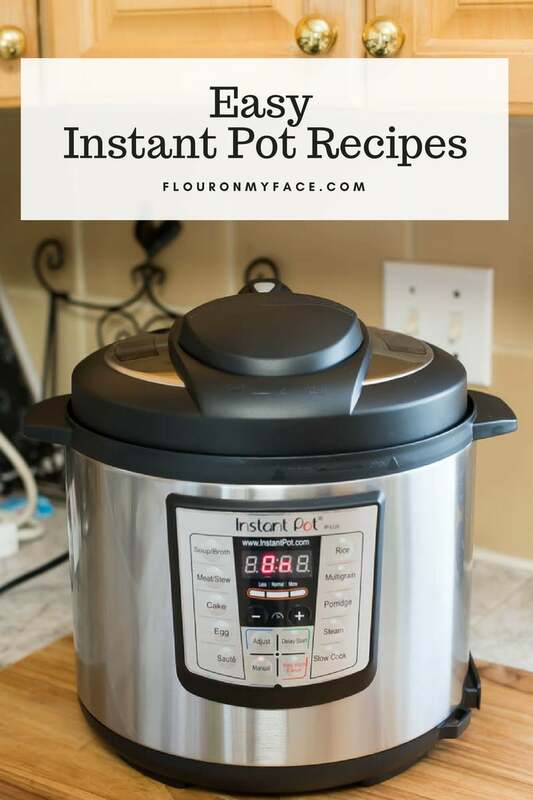 Head over to my Instant Pot recipes page where you will find all the easy Instant Pot recipes I have shared. Hi Arlene – this recipe looks and sounds like a keeper. I have a question on the instructions. They do not say when to put in the 3 bay leaves, or when to take them out. Maybe at step 6 to put them in? Thank you in advance for your help. Hi Bryan yes you are correct. I’ve updated the recipe. Enjoy! We really cannot get enough of soups this season, it’s been brutal. And we have leftover ham from Christmas too! I know where it’s going now 🙂 This looks so rich and delicious. I do not have an Instant Pot, but I can sure adapt this for my regular pressure cooker, or slow cooker. With the cold weather we are having, this is just the kind of meal we need to warm up with. Those beans look so darn colorful! I love that you don’t have soak them. I have to go see if I can find those beans at my grocery store. I guess I could get them online if not right? Looks delicious! I love the fact that you don’t have to soak the beans. Looks delicious! I love how simple and easy this is to make. I am so loving my new Instant Pot Arlene. Can’t wait to try. It is below zero right now — normally we’d be in sunny Florida — may we hear the sad violins?? Anyway, this soup looks like just the remedy for this awful weather. I love the spices and the Cajun touch to the bean soup. Unfortunately we don’t have an Instant Pot but we do have a Dutch oven and a Slow Cooker. I’m copying out the recipe right now. This is on the menu today.